The Story Behind the "World's First Theme Park." Holiday World originally drew its inspiration from the whimsically named town in which it is located, Santa Claus. A bit of history mixed with a dash of lore is in order: The town's founders wanted to call the southern Indiana hamlet, "Santa Fe," but postal authorities determined the name was already taken. On Christmas Eve, 1852, citizens gathered to choose a name for their community. Legend has it that the door of the meeting hall blew open and a certain red-suited gent appeared. Once word got out about the town with the magical name, visitors began making December pilgrimages but were disappointed to find little more than a general store, a post office, and a handful of homes. Third-generation Holiday World president Will Koch said his grandfather had "this kind of crazy idea to build Santa Claus Land" in the 1940s. Opened in 1946, Koch says that Santa Claus Land was the "first theme park in the world." It certainly pre-dates Disneyland (which opened in 1955), but arguments could be made that other "theme parks" going back to the 1893 World's Columbian Exposition or even Denmark's Tivoli Gardens, built in 1843, preceded Santa Claus Land. And other parks, including Disneyland's neighbor, Knott's Berry Farm, also lay claim to the world's first theme park title. At first, the park was open year-round and it recorded its highest attendance during the Christmas season. Santa's toyshop, a Bavarian village, and personal audiences with the triple-ho legend were among the original highlights. The Freedom Train, one of the first attractions, remained in operation until 2013. For its 70th birthday in 2016, the park brought the train back as a nostalgic display. During the 60s and 70s, the Kochs added more traditional amusement park rides. In 1984, the family changed the name of the park to "Holiday World" and introduced sections themed to the Fourth of July and Halloween. Starting in 1995, with the debut of Raven, the park began building world-class coasters that raised its profile. The Legend followed in 2000, and its third wooden coaster, The Voyage, opened to great acclaim in 2006 along with a new holiday-themed land, Thanksgiving. 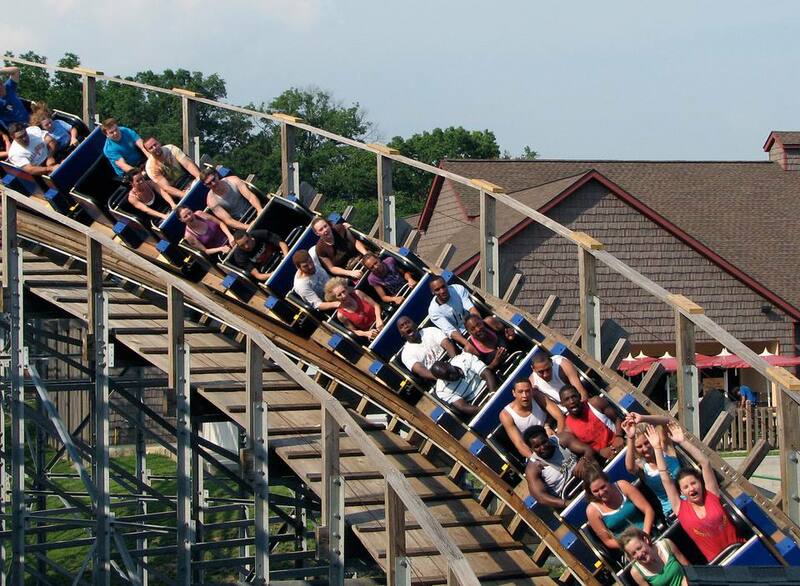 In 2015, Holiday World dubbed its first major steel coaster, Thunderbird, also located in the Thanksgiving section of the park. Its Splashin' Safari waterpark, one of the country's largest and most acclaimed, is included with admission to Holiday World. Ironically, the park discontinued year-round operation in the early 70s and has been closed during the Christmas season ever since. Koch says the proliferation of malls and mall Santas made a Christmas-time visit to Holiday World less special and post-summer attendance dropped significantly. (It is open in late September and October for "Happy Halloween Weekends," however.) For tourists who visit the town of Santa Claus around Christmas, it's like déjà vu all over again. "Unfortunately, there isn't a lot for them to do," Koch acknowledges. Sadly, Will Koch passed away at a young age in 2010. His daughters, Lauren Crosby and Leah Koch, are the fourth generation to own and operate the park.